So we all watch those shows right?? 50 plastic surgery mistakes,50 botched surgries bla bla bla.. Most times those things are not fixable or some lucky enough for something to be reconstructed and all..
For me I am not in anyway against plastic surgery and I do not entirely support it either but in some cases some people need it to make their lives better,easy and get back on their feet maybe after an accident or a life changing procedure..
Say you feel Inadequate about your breasts,you can afford it, you go get it done No I will not judge you. Youve had kids and want to feel young again you go get a breast lift no I will not judge you. You've had bow legs you want to correct them No I will not judge you.. I once watched an episode of those botched this that and some lady was putting diamonds into her eyes by the waterline I couldnt just look WHY! would anyone then want to change the colour of their eyes?? 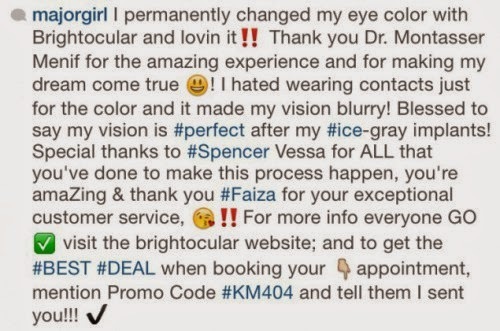 I dont know how the procedure works but at least some work has to be done like INSIDE the eyes! 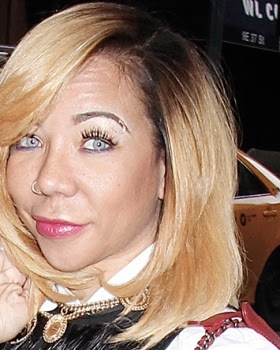 Well Tiny Harris yea TI's wife..has had a recent procedure to change the colour of her eyes and well thats permanently! This post has since disappeared from her Instagram page .She deleted it after alot of backlash..